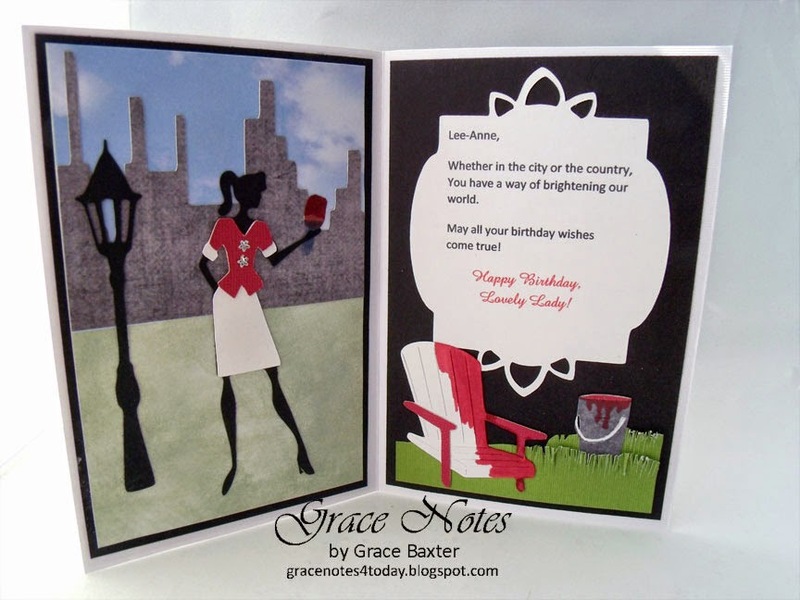 Grace Notes for Today: Paint the Town Red! For a feminine lady who loves all things girlie. 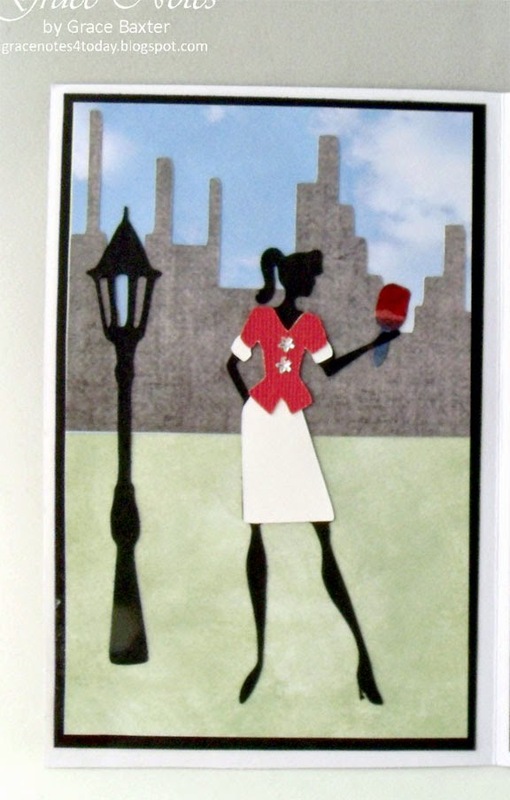 The card is 4"x6" and sets the scene with a cityscape . 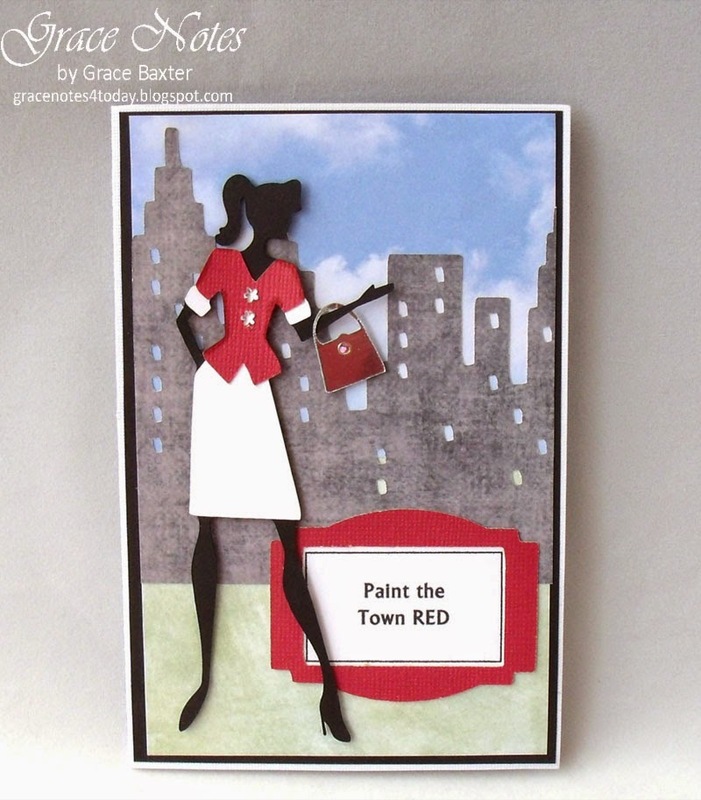 Our model enjoys fixing things up, so "Painting the Town Red" takes on a double meaning for this DIY-er. The scene inside is similar to the front but on a smaller scale. On the front, our model is 5" tall. Inside, she is 4" tall. And instead of posing with her lovey silver bag over her arm, our model here is ready to paint something red. For real! The following picture illustrates the rest of the story. Details about the paint brush are below. The country scene features a lawn chair that is in the throes of being painted. 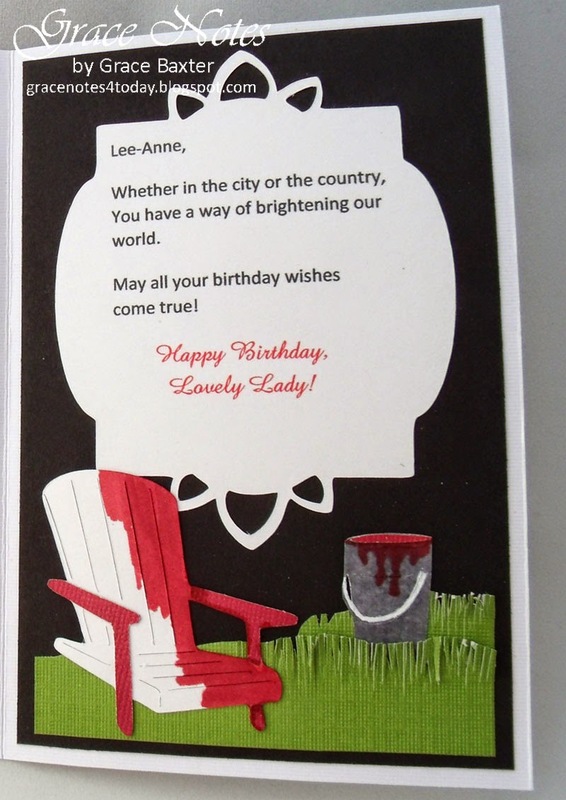 In real life, the recipient has many colourful Muskoka chairs by the lake. I can totally picture her painting one red, then smiling at the idea of relaxing in it later. With my Gypsy, I created a paint brush handle using the tools shape from WIMG. I sized it by dragging it over the model's hand and sizing down until it reached a realistic size (still big enough to know what it is). I cut the rest free-hand. In the end, the handle was too big so I ended up cutting the whole thing down. FYI, the only paint brush available is on the Handy Man cartridge. The chair is made from white CS with layers (arms, legs) cut from red. For a realistic paint job, I painted half of it with my Pro Markers. The colour was a perfect match! I used the sand pail shape from LIAB but made it narrower and trimmed the sides with scissors. Paint drips are painted with Pro Markers. I tried various grass shapes but decided to make my own, freehand. I wanted the grass to be "grassy" and dimensional. I must admit, I love how the grass worked out!